This tutorial was written by Jenny on 4/18/2010. Resemblance to any other tutorial is purely coincidental and unintentional. I am using the artwork of Camilla Drakenborg. You need a license to use her artwork. I am licensed through Artistic Minds Inc.
You can now purchase her tubes through UpYourArt. Open template, shift d to duplicate, close original. Recolor Group-Raster5 to match your supplies. Copy & Paste a couple of the flower doodles of choice as a new layer and arrange to your liking, you may need to resize them just a bit. Copy & Paste bunch of flowers, resize if needed, place upwards, see my tag for placement, duplicate,flip. Select Raster1, selections, select all, float, defloat, copy & paste Paper23 as a new layer, selections,invert,delete, select none, hide original. Recolor Raster 2, Copy of Raster 2 and Copy (2) of Raster 2(stars). Select Raster 3, selections, select all, float, defloat, copy & paste Paper 10 and one tube as a new layer, resize to your liking, selections, invert, delete on paper layer, delete on tube layer, select none, hide original. Raster 4 recolor to match your supplies. Copy & Paste another tube of choice as a new layer, place it as close to the right as you can, see my tag for placement, resize if needed. Copy & Paste flower of choice as a new layer, resize to your liking, place to the left bottom of the canvas. Recolor Copy of Raster 2 and Copy of Raster 5 to your liking. Copy & Paste glitter doodle heart of choice as a new layer, see my tag for positioning. Copy & Paste another flower of choice as a new layer, resize to your liking and place on top of the previous flower. Copy & Paste Charm1 as a new layer, free rotate 90 degrees, see my tag for placement. On the wordart layer, recolor the "Warning" to your liking, selections, select all, float, defloat, new raster layer, flood fill white, move below, select none, you may now need to erase the white layer from the "Warning" portion of the wordart. Copy & Paste Satin Flower as a new layer, resize to your liking, see my tag for placement. Copy & Paste button of choice as a new layer, resize to your liking and place on top of the satin flower. Copy & Paste heart as a new layer, resize and place to your liking. Copy & Paste the last of the 3 tubes as a new layer, place as close to the center as you can, resize if needed. If you do not want to save as a transparent PNG then you will need to unhide the background layer. Now resize the canvas if you'd like. Add copyright info and text and you're now ready to save. Thank you for trying my tutorial. I would love to see your results. Please drop off some love in my C-Box! You will soon find me listed with the other fabulous artists there. Please go ahead and check them out as it is an excellent site with some very talented artists. You can also become a fan of theirs on facebook! Click the link for more details on how to enter and win. 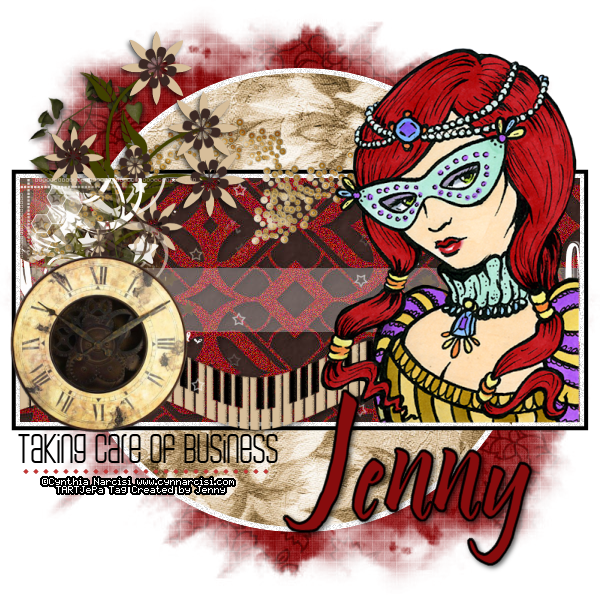 This tutorial was written by Jenny on 4-11-2010. Resemblance to any other tutorial is purely coincidental and unintentional. I am using the artwork of Vicki Yeager. You need a license to use her artwork. I am licensed through Artistic Minds Inc. You can now purchase her artwork through UpYourArt. Open template, hide credits, shift d to duplicate, close original. Select background layer, new raster layer, select with magic wand, copy & paste pp03 into selection, select none, apply mask, duplicate. Select rectangle, selections, select all, float, defloat, copy & paste pp01 as a new layer and one tube of choice as a new layer (resize if needed) position to the right of the rectangle, selections,invert, delete on paper layer, delete on tube layer, select none, hide original rectangle layer. Copy & Paste beads as a new layer, resize to your liking, place below tube. Copy & Paste grass as a new layer, place toward the bottom of the rectangle and below tube layer, select rectangle, selections, select all, float, defloat, selections, invert, delete on grass layer, select none. Copy & Paste any flowers that you'd like to add, resize and place to your liking. Select circle, selections, select all, float, defloat, copy & paste pp07 as a new layer and another tube of choice (resize if needed), selections, invert, delete on paper layer, delete on tube layer,select none, hide original circle. Copy & Paste button as a new layer, resize and place to your liking, duplicate,image, mirror, image, flip. Select frame back, selections, select all, float, defloat, copy & paste pp11 and the third tube as a new layer(resize if needed),selections, invert, delete on paper layer, delete on tube layer, select none, hide original frame back. Copy & Paste stars as a new layer, resize to your liking, add drop shadow, see my tag. Bring the third tube to above the stars now. Select frame, selections, select all, float, defloat, copy & paste paper of choice as a new layer, selections, invert, delete, select none, hide original, apply a subtle drop shadow to the new frame. Recolor the arrive wordart, selections, select all, float, defloat, selections, modify, expand 1, new raster layer, flood fill white, move below, select none, add subtle drop shadow. Now on each of the wordart layer, selections, select all, float, defloat, modify, expand 2, new raster layer, flood fill white, move below, select none,apply subtle drop shadow. Resize the canvas if you'd like. Thank you for trying my tutorial. I'd love to see your results. Please remember to leave some love in the C-Box! 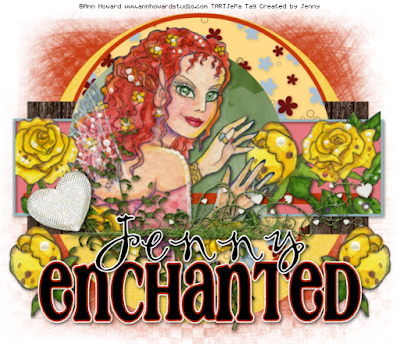 This tutorial was written by Jenny on 4-11-2010. Resemblance to any other tutorial is purely coincidental and unintentional. I am using the artwork of Kat NKDA. You need a license to use her artwork. I am licensed through Artistic Minds Inc. They are no longer open for business. Please use supplies of choice or visit Kat's link for purchase options. Open template, hide copyright layer, word art, word backing and text, shift d to duplicate, close original. Select white circle, selections, select all, float, defloat, copy & paste Paper01 as a new layer, resize 75%, selections, invert, delete, select none, hide original. Select top rectangle, copy & paste paper13 as a new layer, resize 80%, position so that the top of the paper is showing, selections, invert, delete, select none, add a subtle drop shadow, hide original. Repeat on bottom rectangle using the same paper with the bottom portion showing. Select black rectangle, repeat as above changing the paper to paper02 and do not add a drop shadow. Copy & Paste element10 (pink doodle) as a new layer, resize 50% and then again by 95%, add drop shadow, see my tag for placement. Copy & Paste element28 (silver glitter doodle) as a new layer, resize 50%, add drop shadow, see my tag for placement. Copy & Paste element29 (silver glitter leaves) as a new layer, resize 50%, add drop shadow, see my tag for placement. Copy & Paste close up tube as a new layer, resize if needed, position as I have mine, use the selection tool to select around the head, right click, promote selection to layer, move to the top, select none, back on the original tube layer, use the selection tool to remove any excess from the sides. Copy & Paste element01 as a new layer, resize to your liking, place to the left of the frame, add a subtle drop shadow. Copy & Paste butterfly as a new layer, resize to your liking, mirror and flip if needed, add drop shadow, position to your liking. Copy & Paste bow of choice as a new layer, resize to your liking, add drop shadow, position to your liking. Copy & Paste element04(scroll) as a new layer, resize to your liking, add drop shadow, see my tag for placement. Duplicate butterfly, resize once more, place upon the scroll, see my tag. Resize canvas if you'd like. Please don't forget to drop off some love in my C-Box! This tutorial was written by Jenny on 4-11-2010. Resemblance to any other tutorial is purely coincidental and unintentional. I am using the artwork of Angela Newman. You need a license to use her artwork. I am licensed through Artistic Minds Inc. Please check her site for more licensing info. Unhide background layer, new raster layer, select with magic wand. Open Paper 1, image, resize 550 x 550, copy & paste into selection on your working canvas, select none, apply mask, duplicate. Recolor the halftone to match your supplies, resize 95%. Open doodle, resize 300 x 404, copy & paste as a new layer on your canvas, place to the upward right, duplicate,mirror, flip. Recolor the glitter oval to match your supplies. Open Paper 4, resize 550 x 550, on your canvas select Oval, selections, select all,float, defloat, copy & paste the resized Paper4 as a new layer, selections, invert, delete, select none, hide original. Open Paper 2 and resize 550 x 550, on your canvas select HalfCircle, selections, select all, float, defloat, copy & paste the resized Paper2 as a new layer, selections, invert, delete, select none, hide original. Open Frame 2, image, resize 600 x 605, copy & paste as a new layer on your canvas, resize 80%. Select Pink Rectangle, selections, select all,float, defloat, open Paper3, resize to 550 x 550, copy & paste as a new layer on your canvas, selections, invert, delete, select none, hide orignal. Open Ribbon Cluster, resize to 600 x 183, copy & paste as a new layer on the canvas, resize 85%, add drop shadow, see my tag for placement. Open scattered fruits, resize 650 x 96, copy & paste onto your canvas placing it above the new pink rectangle layer, use the selection tool to draw around it, selections, invert,delete, select none. Open bow, resize 350 x 287, copy & paste as a new layer, placing to the upper right of the canvas, resize 75%, add drop shadow. Recolor the Stars to match. Copy & Paste tube of choice, resize if needed, add drop shadow. Thank you for trying my tutorial. I would love to see your results. Please leave some love in my C-Box as it's greatly appreciated. Check out the PixelBerry site if you haven't already. It's located HERE. Click on Artist Stalker then scroll down and hoover over the feature list. The tut that was featured is called Summer Breeze. They featured one of my older tutorials. Such a Honor! This tutorial was written by Jenny on 4-7-2010. Resemblance to any other tutorial is purely coincidental and unintentional. I am using the artwork of Renee Lavoie. You need a license to use her artwork. I have a license through MyTagArt. Please check her site for new licensing information. Open template, hide credits, brush, girly, wordart by missy and punk layers, shift d to duplicate, close original. unhide background layer, select, new raster layer, copy & paste paper of choice into selection, select none, apply mask, pick 2 coordinating colors from the scrapkit you're using and make a gradient, recolor the mask layer. Copy & Paste element 15 (glitter glob) as a new layer, resize if needed, place in the upper left of the canvas. Copy & Paste element 10 (doodle) as a new layer, resize if needed, mirror, flip. Copy & Paste element27 (flower bunch) as a new layer, place it so that the one bloom is sticking out from the left side. Select LargePurpleGlitterCircle, recolor to match. Select the black part of the black & purple circle, selections, select all, float, defloat, copy & paste another paper as a new layer,selections, invert, delete, select none. Using the magic wand, select the purple portion of that same layer, repeat the above step using a different paper, hide original. Copy & Paste element36 (another flower bunch) as a new layer, free rotate right 50 degrees, you may need to resize this layer just a bit, add drop shadow. Copy & Paste element 08 (star doodle) as a new layer. Copy & Paste tube as a new layer, resize if needed, keeping below the glittered circle, you may need to use the selection tool to bring the top portion of the tube out from the circle and use the eraser tool to remove any other excess. Recolor the glittered circle layer. Copy & Paste ribbon of choice as a new layer, resize if needed, add drop shadow. Now go back to the flower bunch that you previousely rotated 50 degrees, duplicate, free rotate 15 degrees right, take the original layer and move it up above the ribbon layer. Select BlackStar, selections, select all, float, defloat, new raster layer, flood fill with gradient, select none, hide original. Copy & Paste element21 as a new layer, resize if needed, place downward of the canvas. Copy & Paste element38 (flowers) as a new layer, resize if need, place downard as well. Copy & Paste element42 (blue glittered star) as a new layer, resize to your liking, place on the recolored Pink glittered star layer, add drop shadow. Copy & Paste element28 (flowers) as a new layer, place to the bottom right of the canvas, add drop shadow. Copy & Paste ribbon of choice as a new layer, place upon the stars, resize if needed, add drop shadow. Add copyright info and text and you're now ready to save your creation. Thank you for trying my tutorial. I hope you enjoyed it. I'd love to see your results! Please leave some love in the C-Box! It's greatly appreciated! This tutorial was written by Jenny on 4-6-2010. Resemblance to any other tutorial is purely coincidental and unintentional. I am using the artwork of Emily White . You need a license to use her artwork. I have a license through MyTagArt. Select background layer, unhide, new raster layer, select with magic, copy & paste paper of choice into selection, select none, apply mask. Select large circle, selections, select all, float, defloat, copy & paste Paper14 as a new layer, you'll need to resize by 50% several times, selections, invert, delete, select none, hide original. Recolor glittered rectangle left, glittered rectangle right,rectangle center, rectangle with giltter edges, dotted circle center and glittered gradient star. Select rectangle left, selections, select all, float, defloat, copy & paste paper4 as a new layer, resize several times by 50%, selections, invert, delete,select none, hide original. Select circle left, selections, select all, float, defloat, copy & paste paper15 as a new layer, as before you'll need to resize several times by 50%, selections, invert, delete, select none, apply some noise (optional), hide original. Select small circle right, selections, select all, float, defloat, copy & paste paper8 as a new layer, resize a couple of times by 50%, selections, invert, delete, select none, hide original. Repeat on small circle left. Select thin rectangle center, selections, select all, float, defloat, new raster layer, flood fill with color of choice, selections, select none, add noise (optional), hide original. Select rectangle center2, selections, select all, float, defloat, copy & paste paper12 as a new layer, resize to an appropriate size, selections, invert, delete, select none, hide original. Select circle 1 center, selections, select all, float, defloat, new raster layer, flood fill with color of choice, select none, apply noise (optional), hide original. Select circle 2 center, selections, select all, float, defloat, copy & paste paper16 as a new layer, resize to your liking, selections, invert, delete, select none, hide original. Select star right, selections, select all, float, defloat, copy & paste paper9 as a new layer, resize to your liking, selections, invert, delete, select none, hide original. Copy & Paste glow as a new layer, resize to your liking. Copy & Paste cards of choice as a new layer, resize to your liking, add a subtle drop shadow, place to the left of your canvas. Copy & Paste balloon as a new layer, resize to your liking, place above cards. Copy & Paste flower of choice as a new layer, resize and see my tag for placement. Copy & Paste ribbon of choice as a new layer, resize and place to your liking, add a subtle drop shadow. Copy & Paste tube as a new layer, resize if needed, add a drop shadow, place to your liking. Copy & Paste butterfly as a new layer, resize to your liking, place above right star, add drop shadow. Copy & Paste string as a new layer, resize and place to your liking. Thank you for trying my tutorial. I'd love to see your results. Please leave some love in my C-Box! It's greatly appreciated!! This tutorial was written by Jenny on 4-7-2010. Resemblance to any other tutorial is purely coincidental and unintentional. I am using the artwork of Joanne Schempp. You need a license to use her artwork. I am licensed through MyTagArt. You can now purchase her tubes at Creative Design Outlet. Open template, hide copyrights, bad romance and wordart, shift d to duplicate, close original. New raster layer, send to bottom, flood fill white. New raster layer, select with magic wand, copy & paste Paper1 into selection, select none, apply mask. Copy & Paste element51 (wire) as a new layer, resize 85% (more if needed). Select circle 1, selections, select all, float, defloat, copy & paste Paper16 as a new layer, resize 65%, selections, invert, delete, select none, hide original. Select circle 2, repeat same as above changing paper. Select rectangle 1, repeat using Paper6. Copy & Paste Fling Frame (5) as a new layer, resize 65%, place upward and to the right, duplicate, mirror, flip. Select frame, selections, select all, float, defloat, new raster layer, flood fill with a matching color, select none, apply some noise, hide original. Select circle 3 repeat same as circle 1 using a different paper of choice. Select circle half 2, selections, select all, float, defloat, copy & paste tube of choice as a new layer, resize if needed, selections, invert, delete, select none, duplicate, on duplicated layer, adjust, blur, gaussian blur 3.00, right click and change blend mode to overlay. Select circle half 1, selections, select all, float, defloat, copy & paste Paper15 as a new layer, resize 65%, selections, invert, delete, select none, hide original. Copy & Paste Fling Frame (12) as a new layer, resize to fit over all the circle layers and the 2 tube layers, see my tag, add a subtle drop shadow to this layer. Select Frame Background, selections, select all, float, defloat, copy & paste Paper7 as a new layer, resize 75%, selections, invert, delete, select none, hide original. Select rectangle2, selections, select all, float, defloat, copy & paste Paper 14 as a new layer, move it upwards so that you can get the bottom design onto your rectangle, selections, invert, delete, select none, hide original. Copy & Paste beads (element45) as a new layer, resize 80%, place on frame background layer, select frame background layer, selections, select all, float, defloat, selections, invert, delete on bead layer, select none. Copy & Paste group of flowers (element 5) as a new layer, resize if needed, place over toward the right, see my tag. Select small circle 2, selections, select all, float, defloat, copy & paste image of choice as a new layer, resize if needed, selections, invert, delete, select none, hide original. Copy & Paste the other tube as a new layer, resize if needed, place to the left over the frame background layer, resize if needed, add a subtle drop shadow. Copy & Paste vine (element 21) as a new layer, resize to your liking, place to the left, see my tag. Copy & Paste button of choice as a new layer, resize to your liking, place in the top corner of the frame background. Copy & Paste double tied string (element 56) as a new layer, resize to your liking, see my tag for placement. Select small circle 3, selections, select all, float, defloat, copy & paste another image of choice as a new layer, resize, selections, invert, delete, select none, hide original, make sure you move this layer up above the double tied string layer. Copy & Paste rainbow stone (element 27) as a new layer, resize if need, place in the bottom left corner of frame background, see my tag if needed. Select small circle 1, repeat same as small circle 3 except change the image, move the new image upward and to the right, see my tag. Copy & Paste at least 2 of the flowers as a new layer, resize and add a drop shadow to each, arrange to your liking. Copy & Paste set of candles as a new layer, resize to your liking, place accordingly. Copy & Paste dangling ribbon (element 14) as a new layer, resize to fit over the button. Add copyright info and text and you are now ready to save your creation. I would love to see what you have created. Please also leave some love in my C-Box. This tutorial was written by Jenny on 4-7-2010. Resemblance to any other tutorial is purely coincidental and unintentional. I am using the artwork of Ann Howard. You need a license to use her artwork. I have a license through MyTagArt. Open template, hide wordart, hearts and copyright info, shift d to duplicate and close the original. Image, resize, make sure your dpi is set appropriately, 650x650, resize all layers checked. New raster layer, select with magic wand, flood fill with a complimentary color of choice, select none, apply mask. The tube I'm using, like many of the tubes offered at MyTagArt, has extra layers. I highly recommend that you use a similar type of tube but if you are using a scrapkit that includes roses/flowers then you should be just fine :). Select Raster2, recolor using the Change to Target Brush. Select circle 1, selections, select all, float, defloat, new raster layer, flood fill with a color of choice (I used the same color as I used on my mask). Select rectangle 1, select all, float, defloat, copy & paste Paper of choice as a new layer, resize if needed, selections, invert, delete, select none, hide original. Select circle 3, repeat same step as above changing the paper. Select frame background 1, selections, select all, float, defloat, new raster layer, flood fill with another color of choice, select none, hide original. Repeat on frame background 2. Repeat same step on frame 1 and frame 2 using a different color, add a drop shadow to each layer. Select circle 4, selections, select all, float, defloat, copy & paste another paper of choice as a new layer, resize if needed, copy & paste tube of choice as a new layer, resize if needed, place to your liking, selections, invert, delete on paper layer, delete on tube layer, select none, hide original. Select rectangle 2, selections, select all, float, defloat, new raster layer, flood fill with a color of choice (again I used the same color as the mask layer),select none, hide original. 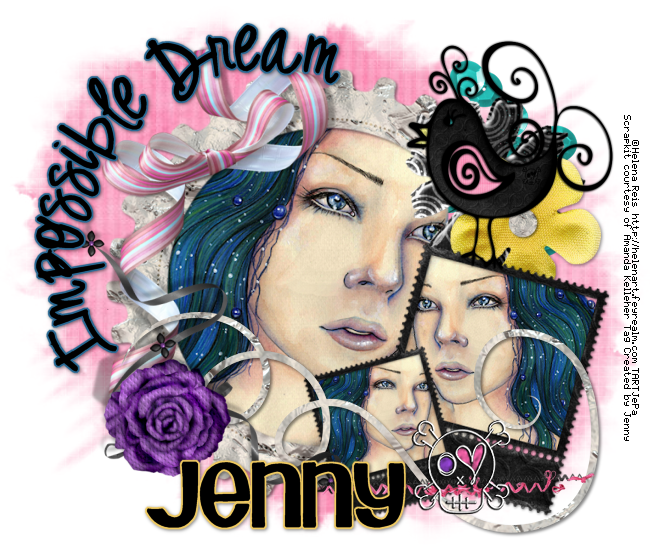 Now you can start to adorn your tag creation with roses/flowers, vines, ivy, ect, see my tag. 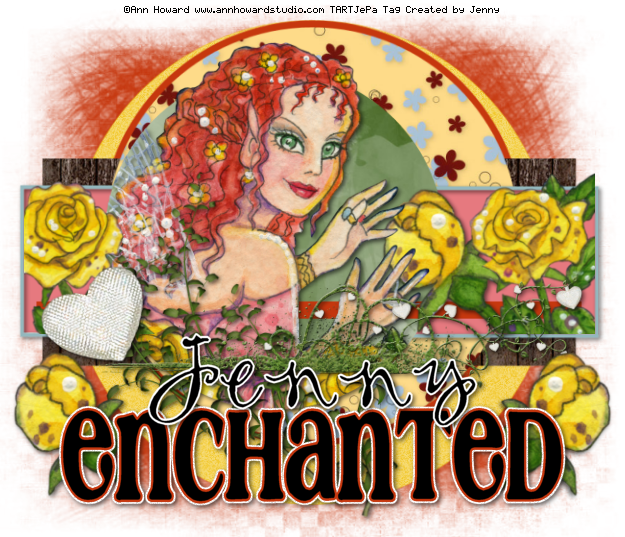 Next I added "enchanted" using Cafe Rojo, background black, foreground same color as mask, stroke width 2.0, converted to raster layer, selections, select all, float, defloat, selections, modify, expand 2, new raster layer, flood fill with white, move below text, select none, add subtle drop shadow. I also added a little noise to the white layer. Resize canvas if you'd like. I resized mine to approx. 625x537. Add copyright info and your name and you're now ready to save. As with any tag creation, don't forget to save a blank incase you want to use it later. Thank you for trying my tutorial. I would love to see your results. Please leave some love in my C-Box! It's greatly appreciated. This tutorial was written by Jenny on 4-6-2010. Resemblance to any other tutorial is purely coincidental and unintentional. I am using the artwork of Joanne Schempp. You need a license to use her artwork. I am licensed through MyTagArt. Open template, hide credits and wordart, shift d to duplicate, close original. Image, canvas size, 650x650, flood fill the rest of the Raster 17 layer with white. New raster layer, select with magic wand, copy & paste paper of choice into selection, select none, apply mask. You'll need atleast 5 more different papers of choice, go ahead and open those and resize them if they are full sized papers. Copy & Paste doodle of choice as a new layer, place upward, resize if needed, duplicate, flip, mirror. Select Black Circle, selections, select all, float, defloat, copy & paste paper of choice as a new layer, selections, invert,delete, select none, hide original. Repeat on Dark Gray Circle, Light Gray Circle, Gray Circle and Green Circle, changing the paper each time. Select Big Flower, selections, select all, float, defloat, copy & paste any paper of choice as a new layer, resize if needed, selections, invert,delete, select none, hide original. Copy & Paste a circle frame of choice as a new layer, resize if needed, add drop shadow, see my tag for placement, this layer should be below the new Big Flower layer. Copy & Paste tube of choice as a new layer, resize if needed, do not add a drop shadow yet, if you want the head to stick out like mine does then you will need to use your selection tool to select that part of the tube, right click, promote selection to layer, move to top, select none, apply a subtle drop shadow to the original tube layer. Copy & Paste rainbow of choice as a new layer, resize if needed, move above the tube layer and upward. Select heart leaves, selections, select all, float, defloat, copy & paste another paper of choice as a new layer, resize if needed, it's best to use several different papers so that it layers the flower nicely, selections, invert, delete, select none, hide original. Select Smaller Flowers, selections, select all, float, defloat, new raster layer, flood fill with a color of choice, select none, hide original. Select Small Flower, repeat same as heart leaves, changing the paper again. Copy & Paste flower of choice as a new layer, place atop the small flower, resize to your liking, add drop shadow. Copy & Paste another flower of choice as a new layer, resize to your liking, place to the left of the canvas, see my tag. Now you can copy & paste a frame of choice, resizing to your liking, place in the bottom left corner of the template. Copy & Paste image 1 of choice as a new layer, resize to your liking, place below frame, add drop shadow to the frame, use the selection tool to remove any excess image sticking out from the frame. Duplicate the frame layer only, resize by about 10% less, copy & paste another image of choice and follow the same steps above for the duplicate frame placing it in the upper right corner. Copy & Paste bow of choice as a new layer, resize to your liking and place upon frame, if the bow is longer (like the one I'm using) you'll need to make sure to bring the promoted layer of the tube up above it as I did. I adorned the bottom frame with a beautiful heart found in the scrapkit I'm using, you may use something similar or the same thing if you have this kit. Use the Preset Ellipse tool and draw out a circle in the middle of your canvas, as you can see there's an opened up spot on the right side of the canvas, this is where we want to put the text first, mirror the preset shape, new raster layer, type out your text, convert to raster layer, hide preset layer, duplicate text, mirror, flip. On each layer of the text, selections, select all, float, defloat, modify, expand 2, new raster layer, flood fill with color of choice, move below text, select none, add drop shadow. Add copyright info and any text you'd like. I did the same thing with my name as I did with the text on the sides except I used a different font (both are listed by name above in my supplies). Now you're ready to save your creation. Thank you for trying my tutorial. I'd really appreciate it if you could take the time to leave some love in my C-Box. I'd also love to see your creations! This tutorial was written by Jenny on 4/6/2010. Resemblance to any other tutorial is purely coincidental and unintentional. I am using the artwork of Cynthia Narcisi. You need a license to use her artwork. I have a license through MyTagArt. Please check her site link above for more licensing info. Open template, close credits, misfit style, glitter and skull, shift d to duplicate, close original. I am assuming that you are using the same scrapkit as I am. You may use any kit that you wish for a substitution. Be creative! Select Raster1, unhide, new raster layer, select with magic wand, copy & paste paper of choice into selection, select none, apply mask. Select teal circle, selections, select all, float, defloat, copy & paste another paper of choice as a new layer, resize if needed, selections, invert, delete, select none, hide original. Select pink rectangle, repeat same step above using a different paper of choice. Copy & Paste Gold Stars as a new layer, resize to your liking, place in the right bottom corner of the new rectangle layer, duplicate, mirror, flip. Copy & Paste Ivy as a new layer, resize to your liking, add a subtle drop shadow, keep it to the left of the canvas. Copy & Paste Piano Keys as a new layer, move down just a bit keeping it on the rectangle layer, resize if needed, it doesn't have to reach across exactly as the tube will be covering the right side of it, add drop shadow. Copy & Paste Scatter as a new layer, resize 75-85%, place upward, still touching the rectangle. Copy & Paste flowers as a new layer, mirror if needed, add a subtle drop shadow, place atop the ivy. Use the Change to Target Brush to recolor the Swirls and Dotted Line if needed. Copy & Paste Clock2 as a new layer, resize to your liking, place in the bottom left corner, add a subtle drop shadow. Copy & Paste tube as a new layer, resize if needed, place on the top rectangle layer, keeping it as close to the right as possible, depending upon the type of tube you are using- you may or may not wish to place a drop shadow on this layer. I did not. Thank you for trying my tutorial. I would love to see your results and would greatly appreciate it if you would leave some love in my C-Box when you drop by. 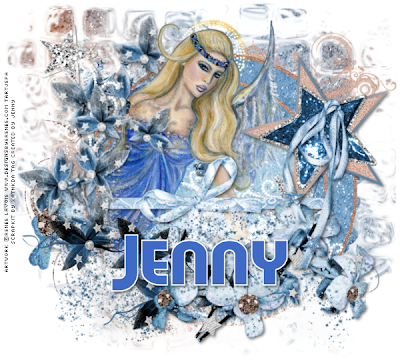 This tutorial was written by Jenny on 4-2-2010. Resemblance to any other tutorial is purely coincidental and unintentional. I am using the artwork of Joanne Schempp. You need a license to use her artwork. I am licensed through MyTagArt. Select background layer, new raster layer, select with magic wand, copy & paste paper10 into selection, select none, apply mask. Select Right Circle, selections, select all, float, defloat, copy & paste paper9 as a new layer, resize 65%, selections, invert,delete, select none, hide original. Repeat on Left Circle changing the paper to paper12 and resize amount to 50%. Copy & Paste element4 as a new layer, resize if needed, move below Right Circle, add drop shadow, see my tag. Copy & Paste tube of choice, resize if needed, add drop shadow, place between Right & Left Circle, see my tag. Select Strip I, selections, select all, float, defloat, copy & paste paper6 as a new layer, selections, invert,delete, select none, hide original. Repeat on all the other Strip layers, change the paper each time. Select Square Frame, selections, select all, float, defloat, new raster layer, flood fill with color of choice, select none, hide original. Copy & Paste image as a new layer, resize if needed, free rotate approx. 8 degrees left, place over the square layer, select the square, selections, float, defloat, invert, delete on image layer, select none, hide original. Hide Flower layer of template, copy & paste a flower of choice as a new layer to replace the template flower, resize if need, add a subtle drop shadow. On the Spring layer, selections, select all, float, defloat, new raster layer, flood fill with color of choice, select none, hide original, selections, select all, float, defloat, modify, expand 1, new raster layer, flood fill with white, select none, move below, add drop shadow. On the wordart layer, select all, float, defloat,modify, expand 1, new raster layer, flood fill with color of choice, move below, select none, add drop shadow. Copy & Paste Easter Basket of choice as a new layer, resize to your liking, add drop shadow, see my tag for placement. Copy & Paste diamond as a new layer, resize to your liking, see my tag for placement, duplicate and place on frame. Copy & Paste bow of choice as a new layer, resize to your liking, place below diamond on frame. Crop the tag to your liking. Add copyright info and text and you are now ready to save. This tutorial was written by Jenny on 4-2-2010. Resemblance to any other tutorial is purely coincidental and unintentional. I am using the artwork of Helena Reis. You need a license to use her artwork. I am licensed to her work through MyTagArt. You can now find her artwork at Dreamscape Imaging. Open a new canvas 650 x 550. Flood fill white. New raster layer, select with magic wand, copy & paste Paper_3 into selection, select none, apply mask. Copy & Paste Frame 3 as a new layer, resize 85%. Copy & Paste tube or image as a new layer, move below frame, resize if needed, use the freehand selection tool to draw around the frame, selections, invert,delete on tube layer, select none, merge frame and tube/image together. Copy & Paste sprinkles as a new layer, place at the top right below the frame. Copy & Paste frame as a new layer, resize 75%, add drop shadow. Copy & Paste image or tube again as a new layer, move below frame, resize if needed, merge these 2 layers visible, free rotate right 15 degrees, duplicate, resize 75%, mirror, see my tag for placement. Copy & Paste Doodle2 as a new layer, see my tag for placement. Copy & Paste ribbon as a new layer, flip, mirror, resize if needed. Copy & Paste stitches and Skull as a new layer, resize each to your liking and place toward the bottom of the black frames. Copy & Paste each of the flowers as a new layer, resize to your liking, see my tag for placement. Copy & Paste Goth Chick as a new layer, mirror, place atop the black frames above the flowers, resize if needed. Using the Preset Shape Tool set on Ellipse with Anti-alias checked, create as vector checked, width 6.00, draw out a circle upper left side of the canvas, mirror it then move it back to the original spot, new raster layer, now type in your text (I used Digs My Hart for this), once finished, convert text to raster layer, hide Preset layer, on text layer, selections, select all, float, defloat, modify, expand 2, new raster layer, flood fill with a matching color of choice, move below, select none, add a subtle drop shadow. Resize canvas if you so desire. Add copyright info and any other text or name and now you're ready to save. Thank you for trying my tutorial. Please remember to leave some love in my C-Box! It's greatly appreciated! I'd love to see your results! Like My Tuts? Vote 4 Me! 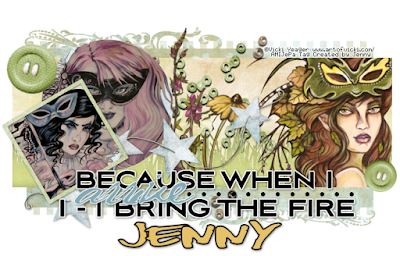 Layout Created by Jenny 2015. Watermark theme. Powered by Blogger.